Sarah Palin at the Iowa State Fair. Former Alaska Governor Sarah Palin says the Iowa State Fair is an “all-American, historic event” and her visit to the fairgrounds today wasn’t meant to “step on” the presidential candidates who are courting Iowans on the eve of Saturday’s Straw Poll in Ames. 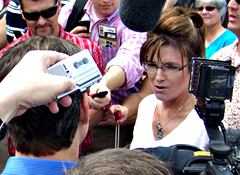 Palin told a crowd of reporters the American people are sick and tired of the “same old talking points” and are yearning for “conviction and passion and candidness” from a candidate. Palin said there is “plenty of time” to “jump in the ring” and run for president, but Palin said she doesn’t want to “string supporters along” and plans to decide within the next “month or two” whether she will run. Palin also suggested straw polls like the one that will be conducted in Ames tomorrow may not be the best “barometer” to judge the 2012 race. Palin was surrounded by a crowd of about 100 reporters and on-lookers as she toured the cattle and swine barns on the fairgrounds. Brittany Elmquist of Audubon said she felt sorry for Palin. “We wish she could enjoy the Iowa State Fair instead of having such a mob around her,” Elmquist said. Amber Greiman of Hudson hopes the Palins enjoyed their time at the fair. “I think it’s cool that they want to come visit the Iowa State Fair,” Greiman said. Palin’s State Fair visit overshadowed more than a handful of presidential candidates who had signed up to give speeches on the fairgrounds, including Tim Pawlenty. Palin was in the livestock barn while Pawlenty was delivering his speech at the “Soap Box”. This past Monday, Pawlenty suggested the presidential campaign will “twist and turn six different times between now and next March” and it’s difficult to know just what the “event of the week” will mean in a few months.